I've just moved into a new decade of my life. In the lead up to this momentous occasion, I had attempted to complete a list of "30 things to do before 30" - inspired by friends and fellow bloggers. I say "attempted", because I didn't get far past writing half the ideas down, let alone ticking all them all off. Never mind. I've extended the deadline another 10 years. And I'm pleased to report that last weekend I ticked one of those boxes - and I didn't have to fly long haul to do it. 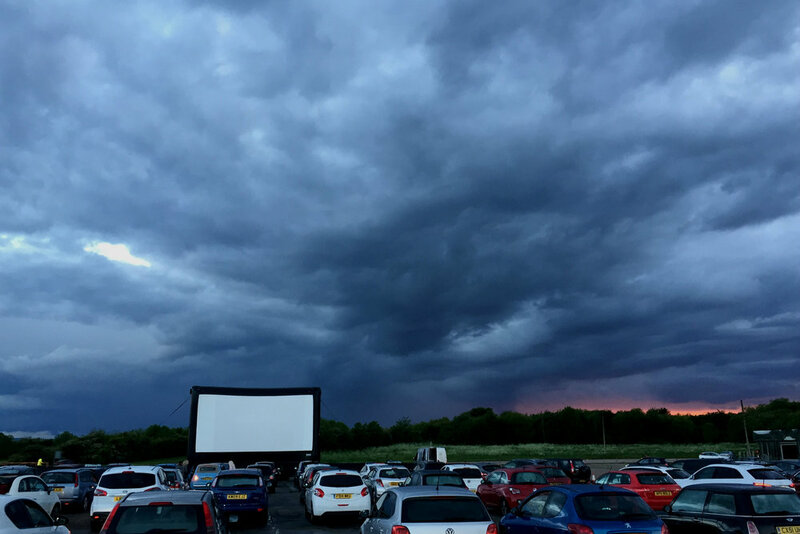 Motion in Motion have brought the American drive-in experience to the UK (more specifically, the East Midlands) and were kind enough to let us into one of their first events. Arriving around 90 minutes before the film started, we were ushered into a great spot on the second row back. Once parked, we were quick to go in search of dinner - locking eyes almost immediately with Peter Pizza (weirdly I'd thought earlier that day that I'd not had one of their sourdough creations for a while). Kindly the chef allowed me to be nosy and climb inside their van to watch our pizzas go into the woodfired oven. To wash it down, Paul opted for a super sweet milkshake creation from the Shake, Waffle and Roll van - while I rather boringly got a tea. Back in the car we pushed back the front seats and got comfy - and increasingly excited as the sun began to dip and the big screen became visible - prompting us to tune our radios into a particular FM frequency. The car stereo sprung to life with a selection of tunes from the film (and boy, is it a good soundtrack!). There was a small delay in the advertised starting time of 9pm, but the general pleasant atmosphere and being in the comfort of our own car meant we were happy to just chat and sing along to the radio. Plus the darker it got, the better the screen view. And then it began - and I quickly remembered how much I like the film, plus we had the added novelty of the situation. It felt a bit like we were in a film when other cars flashed their lights to grab the attention of the stewards walking and rollerskating around with sweets and popcorn. I half expected Rizo from Grease to saunter by. Our enjoyment wasn't dampened (ha) when the rain started pouring - our only concern was how many car batteries might die if we all had to use the wipers for the full film. As the temperature dropped, we snuggled into the duvet we'd brought with us. Unlike being in a normal cinema, it was absolutely fine for us to loudly comment on the film - but we weren't in a complete bubble. We were happily reminded of the other cars and their occupants at key moments in the film - e.g. "Nobody puts Baby in the corner" - when horns started beeping and headlights illuminated the screen. We left (swiftly guided by stewards) listening to the end credit music until the FM frequency was out of range, with big grins. Fully recommended night out.